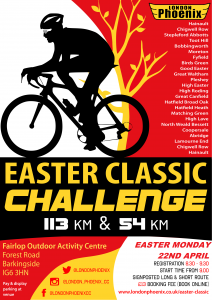 London Phoenix invites you to our 12th Easter Classic sportive – Easter Monday on 22nd April 2019. There are two routes on offer – 113km and 54km (approx) – with fast times expected for those with the legs! 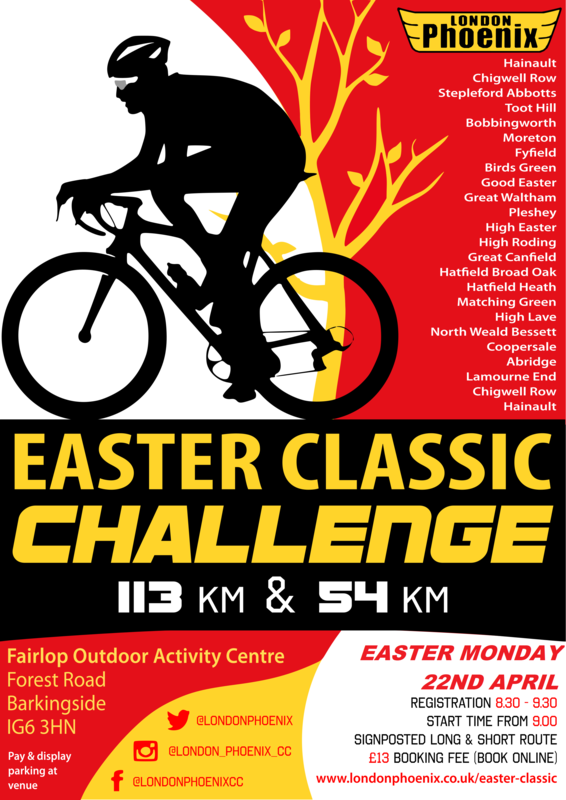 Both routes will take you through the quiet country lanes of Essex. For navigation, download the gpx file to your Garmin or Wahoo, bookmark the Strava link on your phone or pick up a route card at sign-on. We won’t be signing the route this year, due to arrow tampering by local yobs last year (we figured if you can’t rely on the arrows, then there is little point having them). The longer distance will pass through the villages of Good and High Easter, and features a feed station (Pleshey Village Hall) with toilets where you’ll also be served free hot drinks and our legendary oat bars and other wholesome goodies. Places for this extra classic event are strictly limited so tell your mates and book your place soon! Riders can select to ride one of the two routes. * Please note: routes are subject to change on the day depending on road conditions or unforeseen road closures. Therefore, on the day please check at registration for deviations from the documented route. Fairlop Waters Country Park provides car parking, as well as café, fully licensed bar and restaurant facilities. It is easily accessible from the M25, M11, the North Circular and major A roads. Parking is next to the Fairlop Outdoor Activity Centre. Note: the start line is on the same car park so please arrive and park in plenty of time. It’s pay and display – pay by Ringgo only (no cash). Download their app or pay at https://www.myringgo.co.uk/bookparking. ** please remember to bring food and water for your ride, especially if you’re riding the short route. Only the long route has a feed station.